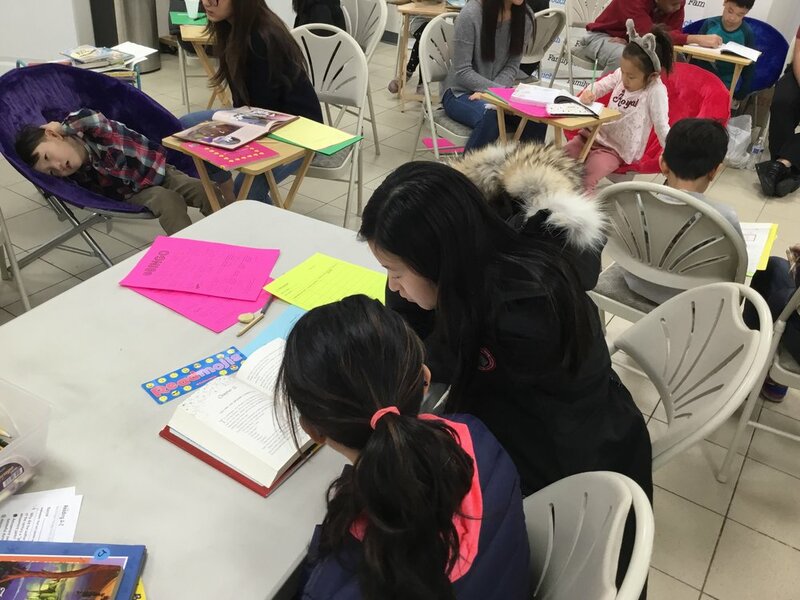 Kellie (11th, Riverdell High School) and Kayla (10th, Bergen County Academies) as an active youth supporters (volunteers) saw that their passion for reading and volunteer experience stemmed the idea for the LIT program. "Kayla and I created the LIT Program to encourage students to engage their minds, to challenge them to read more intensive novels, to push them to think critically, to apply the knowledge from the books they read to real world situations, and most importantly, teach the lessons of the Bible in more kid-friendly ways. We strongly believe that LIT is a program completely different of anything that has been attempted before, as we make our priority assessing students’ needs by getting to know each of them on a personal level." LIT is a book reading time guided by mentors to promote healthy and independent reading habits of the program participants. LIT includes reading books aligned with children's reading levels and individual Bible reading time (optional) to encourage children to expand their knowledge into daily lives. LIT (릿) 프로그램은 멘토들과 함께 책 읽는 시간을 가짐으로 학생들이 주도적이고 건강한 책읽기 습관을 확립하도록 계획 되었습니다. LIT (릿)은 학생별 개인 역량에 맞는 책을 읽을 수 있도록 하고 개인적인 성경 읽기(선택사항)를 포함하므로 학생들이 독서를 통해 배운 지식을 일상생활에 적용할 수 있도록 장려합니다. LIT goes throughout the year. Each student takes reading level test and is assigned to a high school volunteer mentor/teacher. They will be reading books together, expand critical thinking skills by discussions, looking up vocabularies together. LIT (릿) 프로그램은 꾸준한 책읽기를 위해 프로그램과 열린 도서관을 운영합니다. 짝지어진 고등학생 멘토와 함께 책을 읽으며 비판적 사고와 의사 소통 능력을 기르고 모르는 단어를 찾아보며 어휘력도 향상 합니다. 고등학생 형, 누나, 언니, 오빠들을 만나며 건강한 멘토쉽을 통해 사회성도 기릅니다. * 참가 시간은 자유롭게 정하실 수 있습니다. * Student selects individual schedule to attend the program in the registration form. If you wish to be on the waiting list, continue to registration. Please be advised LIT student’s parents are required to attend free parenting education classes. * Registration is limited to the first 20 children.